Definition at line 37 of file llfloaterlagmeter.h. Definition at line 53 of file llfloaterlagmeter.cpp. References LLUICtrlFactory::buildFloater(), LLPanel::childGetText(), LLPanel::childSetAction(), LLPanel::childSetTextArg(), LLControlGroup::getBOOL(), LLUICtrlFactory::getButtonByName(), LLUICtrlFactory::getTextBoxByName(), gSavedSettings, gUICtrlFactory, mClientButton, mClientCause, mClientFrameTimeCritical, mClientFrameTimeWarning, mClientText, mMaxWidth, mMinWidth, mNetworkButton, mNetworkCause, mNetworkPacketLossCritical, mNetworkPacketLossWarning, mNetworkPingCritical, mNetworkPingWarning, mNetworkText, mServerButton, mServerCause, mServerFrameTimeCritical, mServerFrameTimeWarning, mServerSingleProcessMaxTime, mServerText, mShrunk, onClickShrink(), LLFloater::setIsChrome(), and TRUE. Definition at line 127 of file llfloaterlagmeter.cpp. References gSavedSettings, mShrunk, NULL, onClickShrink(), LLControlGroup::setBOOL(), and sInstance. Definition at line 156 of file llfloaterlagmeter.cpp. References LLPanel::childGetText(), LLFocusMgr::getAppHasFocus(), LLControlGroup::getF32(), LLStat::getMeanDuration(), LLTextureFetch::getNumRequests(), gFocusMgr, gSavedSettings, gTextureFetch, gViewerStats, LAG_CRITICAL_IMAGE_NAME, LAG_GOOD_IMAGE_NAME, LAG_WARNING_IMAGE_NAME, mClientButton, mClientCause, mClientFrameTimeCritical, mClientFrameTimeWarning, mClientText, LLViewerStats::mFPSStat, LLStringBase< char >::null, LLViewerImage::sBoundTextureMemory, LLButton::setImageUnselected(), LLTextBox::setText(), and LLViewerImage::sMaxBoundTextureMem. Definition at line 207 of file llfloaterlagmeter.cpp. References LLPanel::childGetText(), LLStat::getMean(), gViewerStats, LAG_CRITICAL_IMAGE_NAME, LAG_GOOD_IMAGE_NAME, LAG_WARNING_IMAGE_NAME, mNetworkButton, mNetworkCause, mNetworkPacketLossCritical, mNetworkPacketLossWarning, mNetworkPingCritical, mNetworkPingWarning, mNetworkText, LLViewerStats::mPacketsLostPercentStat, LLViewerStats::mSimPingStat, LLStringBase< char >::null, LLButton::setImageUnselected(), and LLTextBox::setText(). Definition at line 258 of file llfloaterlagmeter.cpp. References LLPanel::childGetText(), LLStat::getCurrent(), gViewerStats, LAG_CRITICAL_IMAGE_NAME, LAG_GOOD_IMAGE_NAME, LAG_WARNING_IMAGE_NAME, mServerButton, mServerCause, mServerFrameTimeCritical, mServerFrameTimeWarning, mServerSingleProcessMaxTime, mServerText, LLViewerStats::mSimAgentMsec, LLViewerStats::mSimFrameMsec, LLViewerStats::mSimImagesMsec, LLViewerStats::mSimNetMsec, LLViewerStats::mSimScriptMsec, LLViewerStats::mSimSimPhysicsMsec, LLStringBase< char >::null, LLButton::setImageUnselected(), and LLTextBox::setText(). Definition at line 140 of file llfloaterlagmeter.cpp. 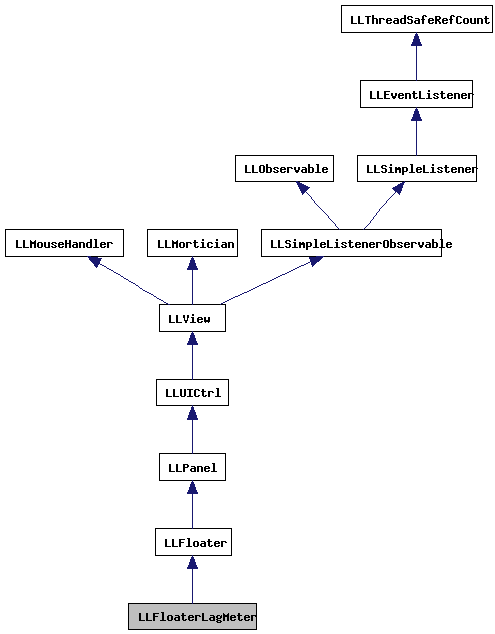 References determineClient(), determineNetwork(), determineServer(), and LLFloater::draw(). Definition at line 312 of file llfloaterlagmeter.cpp. References FALSE, r, S32, LLUICtrl::setFocus(), and LLButton::setLabel(). Referenced by LLFloaterLagMeter(), and ~LLFloaterLagMeter(). Definition at line 150 of file llfloaterlagmeter.cpp. 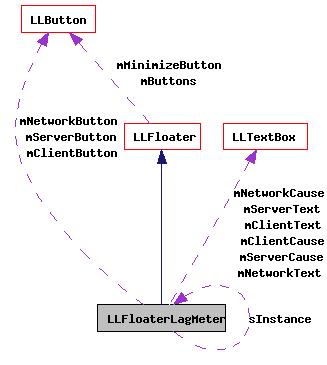 References LLFloaterLagMeter(), LLFloater::open(), and sInstance. Definition at line 58 of file llfloaterlagmeter.h. Referenced by determineClient(), and LLFloaterLagMeter(). Definition at line 60 of file llfloaterlagmeter.h. Definition at line 56 of file llfloaterlagmeter.h. Definition at line 57 of file llfloaterlagmeter.h. Definition at line 59 of file llfloaterlagmeter.h. Definition at line 54 of file llfloaterlagmeter.h. Definition at line 66 of file llfloaterlagmeter.h. Referenced by determineNetwork(), and LLFloaterLagMeter(). Definition at line 68 of file llfloaterlagmeter.h. Definition at line 62 of file llfloaterlagmeter.h. Definition at line 63 of file llfloaterlagmeter.h. Definition at line 64 of file llfloaterlagmeter.h. Definition at line 65 of file llfloaterlagmeter.h. Definition at line 67 of file llfloaterlagmeter.h. Definition at line 73 of file llfloaterlagmeter.h. Referenced by determineServer(), and LLFloaterLagMeter(). Definition at line 75 of file llfloaterlagmeter.h. Definition at line 70 of file llfloaterlagmeter.h. Definition at line 71 of file llfloaterlagmeter.h. Definition at line 72 of file llfloaterlagmeter.h. Definition at line 74 of file llfloaterlagmeter.h. Definition at line 53 of file llfloaterlagmeter.h. Definition at line 77 of file llfloaterlagmeter.h. Referenced by show(), and ~LLFloaterLagMeter().